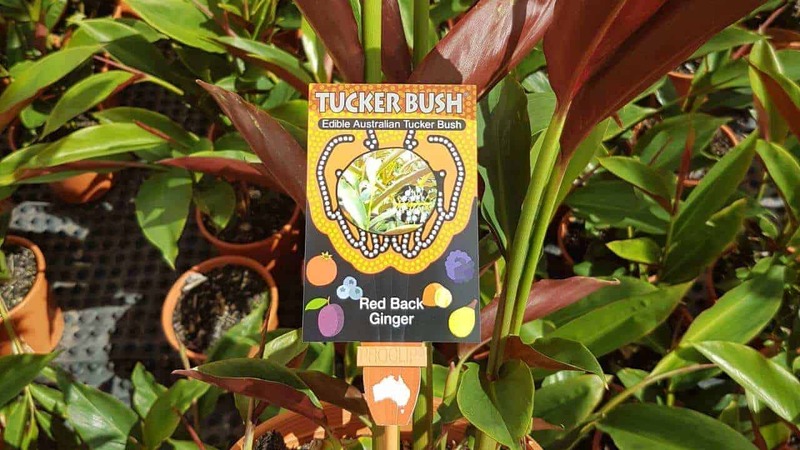 Red Back Australian Ginger is a versatile plant traditionally used by the Aboriginal people for food and crafting. In the wild, this species can be found in the rainforest understories of Northern New South Wales and Southern Queensland — this particular variety comes from the Atherton Tableland highland region near Cairns. Both the spicy root and bright blue fruit may be eaten. The ginger-scented rhizome may be used, like other ginger roots, in savory dishes, desserts, jams, marmalades, candies and tea. 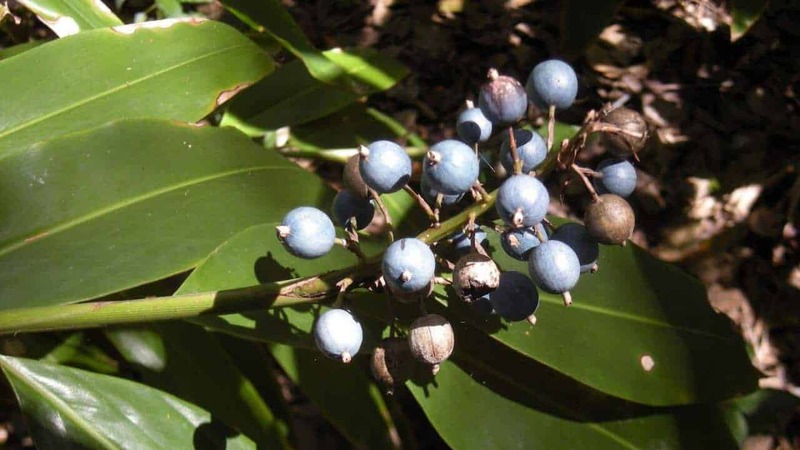 Though the seeds should not be eaten, the berries have a pleasant lemony ginger flavour and were often eaten by Aboriginal nomads to moisten the mouth during long walkabouts. The Red Back Australian Ginger’s large leaves were traditionally cut and used in thatch shelters and as food wrappings during cooking. Fragrant white flowers appear from late Spring to early Summer, eventually leaving blue berries that may be picked and eaten straight off the stem. To harvest the root, simply dig it up and prepare for cooking. This plant can grow up to 2m high and 1m wide. 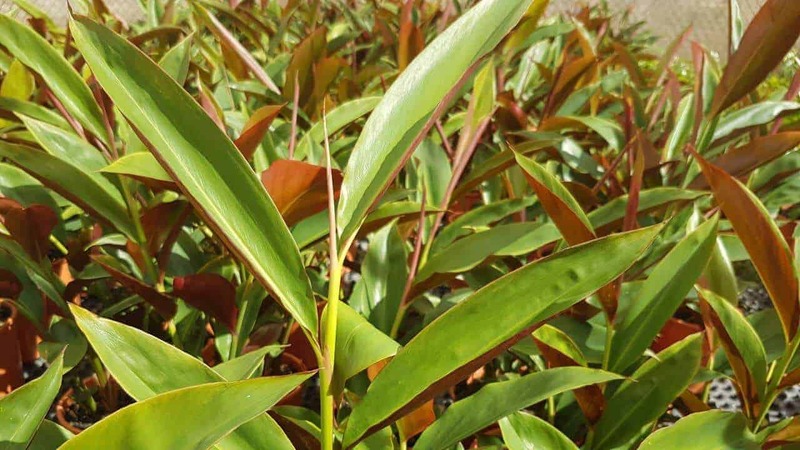 It’s suitable for gaps, pots, borders, narrow poolside beds and mass plantings. How often should I prune my Red Back Australian Ginger? Prune throughout the year as needed by removing older leaves and flower stems. How much water should I give my Red Back Australian Ginger? Your plant can survive drying out between waterings, but prefers a constantly moist soil. Water thoroughly and often in Summer, remembering to mulch before the onset of intense weather. Can I plant Red Back Australian Ginger in full sun? Preferably not, as this increases the likelihood of your plant and soil drying out. The leaves also burn easily in full sun. If you only have a sunny spot available, consider adding a shade to protect it from the harsh afternoon and Summer sun, or plant your ginger in a pot instead. How big a pot do I need to grow a Red Back Australian Ginger? Choose at least a medium sized pot to allow room for your ginger root to grow.